These Perfect Egg McMuffins are a quick and healthy way to start (or end) your day. I’m changing things up! Who needs a blog schedule, right? (JUST KIDDING, I DO) But really, we made these two night ago for dinner and I just HAD to blog them because they are easy and delicious and perfect. I give you: Perfect Egg McMuffins. We were out of town this past weekend for a wedding, and had some incrEDIBLE food experiences. But it also meant coming home to an empty fridge. And tired Hillary wasn’t about to go out on Tuesday night to the store. We had: sliced cheese, English muffins, eggs, green onions, carrots, a zucchini and a Brita. It was starting to look like slim pickins around these parts. Truly, I don’t know what else to call these. “English Muffin Breakfast Sandwiches” just don’t have the same ring. So, although the fact that these have eggs and are on an English muffin is where the similarities stop between those from the Golden Arches and myself, I just resigned to calling them the very same thing. Except note that I called them perfect. I don’t call many things perfect. But these might just be it. If not for the perfect nature of the sandwich itself, for the perfection of the egg. Read on. First of all, I listened to this amazing podcast with Tim Ferriss and Chris Young, author of an incredible anthology of food (which I also want, but costs zillions of dollars…check it out on Amazon here at my affiliate link!) But he talked about making the “emoji egg,” or, a true sunny side up egg that requires no flipping and looks just like the egg-in-pan emoji. He also has a website called ChefSteps, where they have a video on how to do it. Remembering this while I’m looking at an egg crate in my bare fridge, I set out to make an emoji egg of my own. It wasn’t quite as beautiful because I did two in the pan at the same time, so I had to cut one of the edges to separate the two – but I definitely was proud of my beautiful egg. The trick is: low and slow. On my gas stove, I put it at “low,” not even “1.” and let it go for about 5 minutes. And it was truly perfect. Also while on our little mini-vaca, I was watching some Bobby Flay show and he made scrambled eggs with green onions in them. 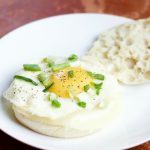 And I thought, “oh, I bet that would taste pretty good!” Obviously that inspiration led to topping these ultimately easy breakfast sandwiches with a small handful of these babies. It is so totally worth it, and really elevates breakfast to a new level. Although – you’ll taste like onions afterwards. Best eaten pre-tooth brushing! 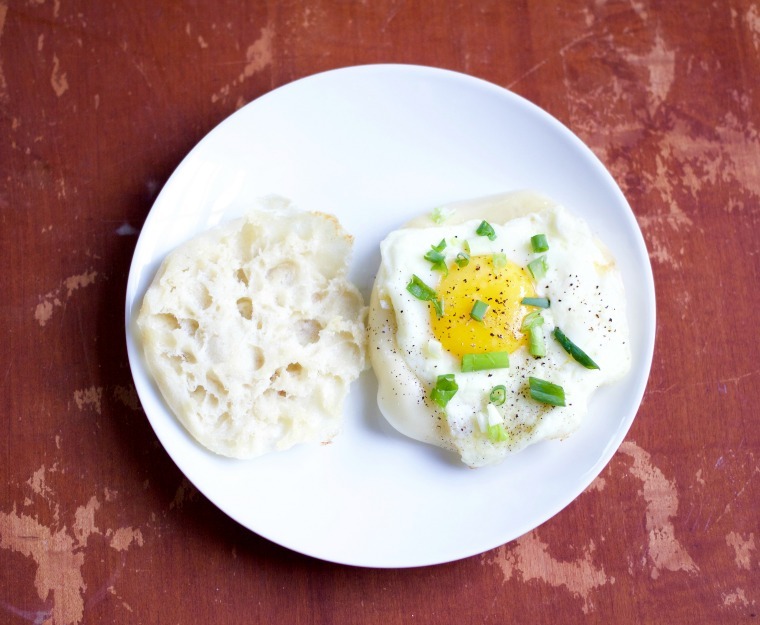 Local Spotlight: Eggs and green onions were from the farmers market! Luckily they stuck around for a few extra days. Local eggs, since they are not washed, keep for an exceedingly long time. What is your go-to quick breakfast? Will you try these perfect egg McMuffins? Let me know in the comments! Heat half the butter on medium heat and place the English muffin halves face down to toast them. Once browned, remove from pan and turn heat down to low. Add additional butter and allow it to melt. Crack egg directly into the pan. Let it cook for 4-5 minutes. Return one half of the muffin into the pan and place slice of cheese on top to allow it to melt a little. When egg is done, lift with spatula and place on top of the cheese slice. Season egg with salt, pepper and green onions. Top with remaining half of the muffin. Made one of these this morning… Worked perfectly and was absolutely delicious. Happy to hear it! I think it’s so cool to learn new techniques! This does look perfect! Your egg is a real-life emoji! Now I want to try making one…I’m usually too impatient, but I think I can spare five minutes if that’s all it takes. ? I’m a “set it and literally forget about it and then it’s burned” person. so it worked for me! !